My cousin recently adopted a great little Beagle and while she is normally practically perfect, if she happens to get loose, there’s no denying a Beagle’s nose and she’s off. There’s basically two solutions to the problem – management and training. The management part means always having Sophie on leash, but the limitation of this approach is sometimes mistakes happen and Sophie gets loose. The second option – training – works, but only with a lot of time, dedication and repetition. That’s true with any dog, but with hounds it can take even more effort since their nose tends to turn off their brain. So the goal is to train to the point that coming when called is automatic and triumphs over instinct. For anyone working on achieving the automatic recall, here are some guidelines for getting there. Begin teaching the recall word, such as “come” or “here” in a place where there are very few distractions, such as in a room in the house. Start at a short distance (3-5 feet), say the word and encourage her to come to you. Reward with a really yummy treat (chicken). When training, try to use a treat that high value and something she doesn’t get at any other time (keep it special). After she comes to you, reward her with the treat and then just ignore her. She will eventually wonder off and then you can try to call her again. Always reward with the treat. You can fade this later, but in the beginning, keep it worth it for her. GRADULLY increase distance. Once you are able to call her across the length or a room, move into different rooms and across the house, then upstairs – hallways are good. Once you have a reliable recall in the house, move to the garage. Once solid there move the back yard. Each time you change environments, start over close to her and then gradually increase the distance. Gradually increase distractions (in the house, but with kids playing nearby). Training is all about building blocks and baby steps. Keep sessions short (5-10 minutes). More short sessions are much better than one long session a day. If at any time in this process you try to call your dog and she doesn’t come to you, then you are either too far away, not exciting enough, or you advanced too far too fast. This then is your fault, not hers. Start over in a less distracting environment, closer, or make your voice higher pitched to encourage her. There are a couple other ‘games’ a family can play together that helps reinforce the right behavior. Variation 1: At least two people are needed for this exercise. Take turns calling your dog down a hallway or in the kitchen. As she is coming to you, encourage her with enthusiasm. Every time she comes to someone have her sit, touch her collar and then give her the treat. If you ask her to sit and she doesn’t, then she doesn’t get the treat. Your attitude should still be upbeat, but it is very important to only reward correct behavior. Rather than repeatedly asking her to sit, have the other person try calling her. Variation 2, Hide and Seek: At least two people are needed for this exercise. One person holds on to the dog while the other person goes and hides. The hiding person says “[Dog’s Name] Come!!”. When she arrives a greeting celebration should ensue. During this time the other person hides. The dog is then sent, on that person’s command, to make another find. Variation 3, Random: Only one person is needed for this exercise. At random times, call your dog and reward her with a treat or play session. Try to pick times when you are pretty certain she will want to come anyway. In fact, you can precede all enjoyable activities with a recall, so that your dog learns something good is always going to happen when she hears the word “Come”. One person is the handler and the other person is the distracter. The handler has no treats, or any kind of reward on him. The distracter has rewards like good food and maybe toys. The distracter shows your dog that he has these wonderful things, but doesn’t let her have any of them. The handler goes a short distance away and calls your dog. 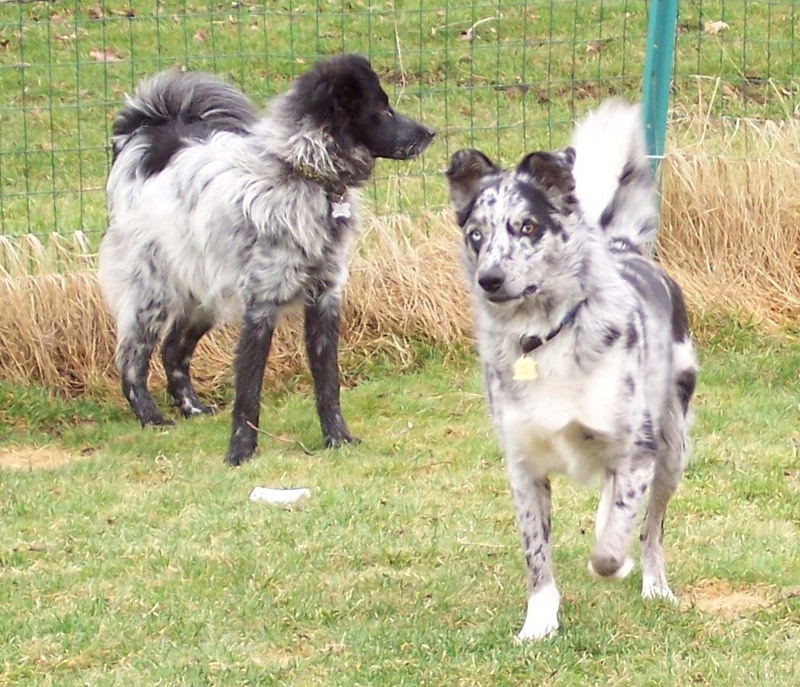 The dog may ignore the handler and try to get the reward from the distracter. The distracter must ignore all attention from the dog, including barking, jumping up, etc. The distracter becomes a block of ice. The handler keeps calling the dog, encouraging her with voice and fun movements, while remaining in place. Sooner or letter, the dog will begin moving toward the handler. As soon as this happens, praise enthusiastically. When she arrives at the handler and sits, the distracter immediately runs over and gives a big treat or a good toy to the handler who in turn immediately gives the toy or treat to the dog. After a minute of play to break any tension, repeat the exercise with the same two people acting in the same roles. The repeat of the exercise starts by the distracter moving away and then the handler starting to call the dog again. This exercise will teach your dog that the way to get what the distracter has is to do what the handler is saying. This exercise can take time and patience, so be prepared. If done correctly, and after a number of repetitions, you should end up with your dog flying off the distracter in order to respond to the handler’s command to come. If your dog thinks she’s getting smart by coming to the handler before the handler has issued the “Come” command, simply ignore her. Once the exercise has been repeated with the same two people in the same roles of distracter and handler, switch roles so that your dog learns that the command “Come” is the key thing, not a specific person. 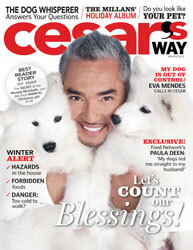 If you haven’t seen it yet, Cesar Millan now has a quarterly magazine. The man is an amazing marketing machine. He seems to have endorsed about a zillion products and most of them are advertised in his magazine. If you were hoping for a magazine full of information and training tips you will be disappointed. On the other hand, if you were hoping for a version of People magazine with dogs, you’ll be satisfied. I discovered the second issue of his magazine while at the airport earlier this month. I saw it on the newsstand and picked it up to leaf through it. I stopped when I recognized the picture of someone I had worked with during the Hurricane Katrina rescue effort several years ago. With someone like Johanna Harris featured in the magazine, I figured it was worth the $4.99 cover price, so I picked it up. Unfortunately the article on Johanna, as well as the other stories in the magazine, is all fluff with no real content to speak of. There are a lot of glossy pictures of dogs and celebrities, but even the sections that feature training advice don’t have enough details to give anyone guidance. When the Cesar Millan television show first became popular, I would grimace at how he made everything look easy. It’s never that easy. Over time, his show has improved; he uses treats sometimes and he seems to explain his process a little better. I have no doubt that this man has a unique ability to communicate with dogs, but I’d take Victoria Stilwell any day if I could only watch one dog training TV personality. Maybe someday Victoria will start a magazine, or maybe just sticking with wonderful trainers and writers such as Patricia McConnell and Pat Miller who are featured in magazines like Bark or Whole Dog Journal is good enough. Dog obedience has come a long way since I started taking and teaching classes almost 20 years ago. Back then, we thought we were progressive by using a braided choke chain instead of a metal one and by starting to use treats. Well the treats were the right idea, but we’d still snap the choke to get our dog’s attention – in retrospect a rather mixed message I’d say. Today the latest training philosophies are based on building blocks of behavior; rewarding each small step in the right direction, allowing the dog to chose to do the behavior you are ultimately looking for. By engaging the dog in the process, not only does the behavior become more solid, the dogs enjoy doing it. If there’s a down side to this approach to training, it’s that it takes more patience and discipline on our part to work at our dog’s pace rather than our own, but the pay off is really worth it. By way of example, check out this great video from Jean Donaldson called Conditioning an Emotional Response. The video shows how to condition a dog to wearing a Gentle Leader. Here’s a great video someone sent me from the Clicker Training website. Even if you don’t use a clicker, this provides some good lessons. I love how this video demonstrates calm and persistence to achieve a calmer dog. I wish there was a little more narration, but it’s worth watching through to the end because as the video progress, you can actually see the dog start to calm down. At least until the owner shows up at the end (isn’t that always the way!) But even then, you can see how the training has allowed the dog to regain control of himself faster and that the dog is now seeking guidance in how to behave. If you have one of those high energy dogs that loves tennis balls and is always looking for something to do, consider investigating the sport of Flyball. For the professional handlers this is serious competition, but for the dogs it’s crazy fun. Basically Flyball is a sport where the dog has to jump over 4 hurdles, hit a box that shoots out a tennis ball, catch the ball and then run back over the 4 hurdles as fast as possible. This is a relay event, so there are two teams that run at the same time on two parallel courses and there are four dogs with four handlers on each team. The dogs run one after the other and the team that accurately finishes first wins. One of the funny things about this sport is that the height of the hurdles is determined by the shortest dog on the team, so you will often find teams with three larger dogs and one Jack Russell or other small active dog. This is an equal opportunity sport, so any breed or mixed-breed of dog can participate.